Vancouver’s Tent City has gotten a lot of attention from the media, and recently from City Hall. It all began on July 9th with the Housing Justice Day of Action. 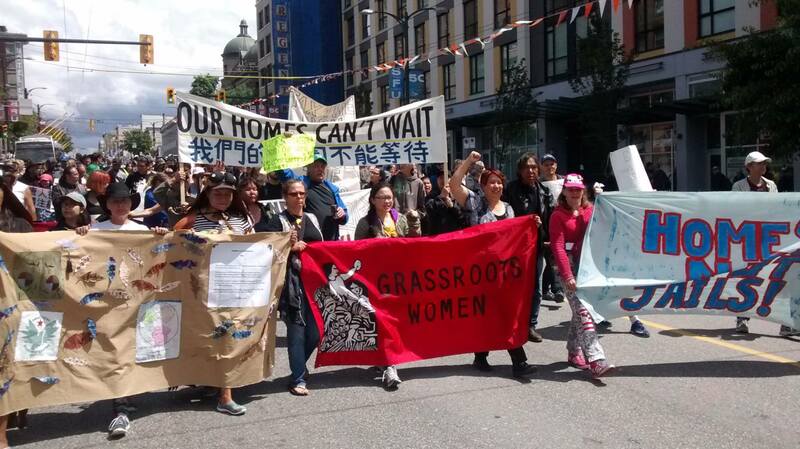 The Housing Justice March was attended by approximately 250 people, ending at 58 West Hastings. As community members gave speeches, and volunteers prepared for the community feast, organizers announced a new tent city would be set up on the site. The tent city grew, slowly at first, but soon reaching capacity at about 80 tents. The tent city – one part direct-action and one part emergency survival – is a critical response to a homeless count and homeless deaths that continue to grow as Gregor Robertson’s expired promise of ending the homelessness crisis fades into the distance. Homeless people come to the tent city out of necessity – fleeing the daily harassment of cops and security – but also because of the community, support and safety that exists at the site. Tent cities also makes the everyday crisis of homelessness visible. On July 12, representatives of the Tent City and other community groups went to City Hall, to present their demands and speak with the Mayor himself. After being blocked from attending City Council, and being kept waiting all day, the Mayor eventually met with the delegation of residents. The delegation asked the Mayor to meet the Our Homes Can’t Wait campaign demands: ten new buildings of social housing in the Downtown Eastside, measures to improve SRO hotels and rent control. Residents also questioned the City’s new definition of social housing, which excludes people on welfare, emphasizing that social housing must rent for the welfare/shelter rate of $375 per person if the City wants to end homelessness. VANDU members also spoke to the importance of funding housing, instead of increasing the policing budget. The Mayor has committed to meeting with residents in the DTES, and will be coming to Carnegie next week to meet with residents of the Tent City and community members. So far he has refused to provide bathrooms and washing facilities. “It’s because he doesn’t want us to stay there,” Samona says. “But we’re not going home and we’re not giving up.